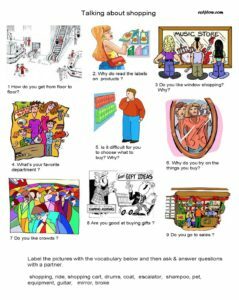 This is an elementary ESL speaking exercise for practicing language useful for talking about shopping. Shopping is a great topic for English language students as it is universally accessible. Using pictures with the questions gives context. The vocabulary at the bottom of the page can be matched to the pictures as an icebreaker. Students can discuss and answer the questions in groups or in pairs. Click on the image or the link at the right.to download the printable PDF file. 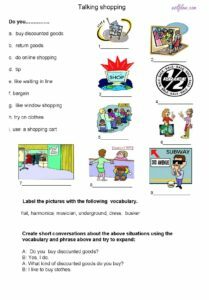 This is an elementary brainstorming exercise that aims to elicit some vocabulary and warm up the students for a lesson about fashion and shopping. Try to get as much vocabulary as possible on the word maps from the students and then ask them to complete the questions at the bottom of the page. Then they can ask and answers questions in pairs or groups. This is a really easy elementary exercise for pretty low level English language learners to talk about shopping. Students match the words and expressions to the pictures and then have short conversations. This is a fairly elementary exercise. 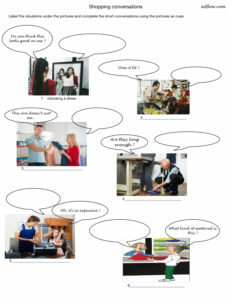 It challenges students to understand the context of each picture and complete the speech bubbles. practice common conversational exchanges involving customer service.